I hunt coyotes. It's one of my favorite things to do. I've been hunting coyotes for over 20 years. Every fall when the temps start to turn cold, song dogs all across South Dakota start putting on fur. While fur prices are nothing like they were a couple decades ago, a prime silver-belly coyote can still bring as much as $40 on the dog, and quite a lot more if you skin them out. Yet the money just helps offset the fuel expense. The real reason I hunt them is the public service aspect. Cattle and sheep ranchers lose calves and lambs to coyotes each year. It's also very challenging and exciting. With winter storms like that which decimated the cattle in western South Dakota last week, the ranchers need all the help they can get. Having one of the most alert and wary animals in God's creation come prancing into your call looking for a meal is one of the most adrenaline-pumping situations you can get yourself into as a hunter. It never gets boring, and it's just as difficult today as it was 20 years ago. Come to think of it, it's even harder now than it was then. Back when I started, almost no one else was doing it. These days, thanks to Randy Anderson and the like, everyone is out trying to call coyotes. This makes for some wary coyotes by the time February rolls around! Throughout my life I have chosen all manner of rifles to hunt coyotes with. Obviously there are too many to talk about here, but I do vividly remember the few primary rifles that got me through the years. My first coyote rifle, a Winchester model 70 in .243win, was a gift from my father. I used it throughout my teen years for coyotes and deer with great success. It absolutely hammered the coyotes. However, due to the fact I was using a heavier bullet which could cross over to deer season, it often tore some big holes! Next came an 16" Olympic Arms AR15 in .223rem. The AR15 makes a great coyote rifle, providing those fast follow-up shots for multiple coyotes, or when that first shot didn't go exactly as planned. However, even at 16" that bull barrel AR was pretty heavy! Not much on the performance side of things either. At the time, I was using Hornady 52gr BTHP loads from Black Hills Ammo. It was very accurate, but lacking in trajectory and knock-out power. A coyote facing me was finding his nose in the dirt every time, but the broadside shots brought mixed results regardless of shot placement. Obviously the chest-shot dogs would die, but they wouldn't do it right then and there. Many times they would run 30-75yds before expiring. Not happy with this, I decided to hang up the trusty AR15 in favor of something lighter, and faster. That came in the form of a Remington 700 chambered in 22-250. You can see it pictured in the image at the beginning of this article. It was around this time that Primal Rights began working with Travis Stevens of TS Customs in Miller, SD. Travis being a top-notch riflesmith, was just the man to help me get my 22-250 in order. 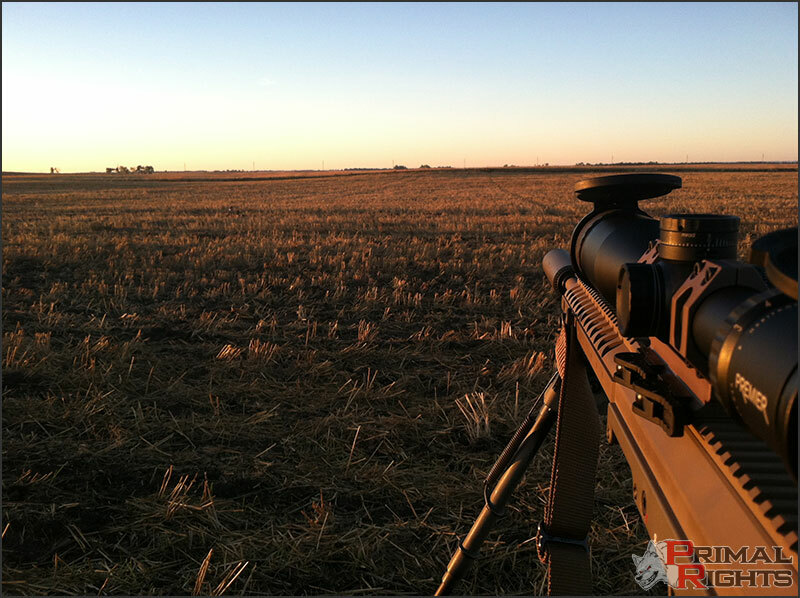 The Rem 700 action was bedded in an HS Precision stock. I replaced the trigger with a Timney 510. Other than my custom krylon "sponge" camo job, there really wasn't anything else done to it. With Travis's help, I was able to get that factory 24" 22-250 shooting 3/4 MOA @ 100yds. The new stock and bedding job reduced the group size by half, and produced a consistent POI. With the factory stock, point of impact would shift as much as four inches from group to group! I loaded the 22-250 with a stout load of Varget behind a Hornady 50gr V-Max. 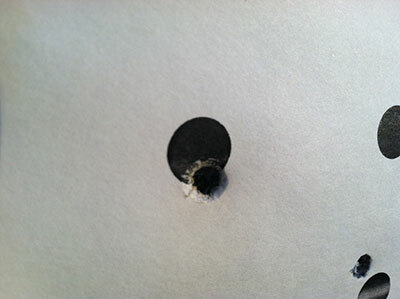 I had hoped the added velocity of the 22-250 would eliminate the splash wounds I saw with the same bullet in .223rem. Unfortunately this was not the case. The 22-250 had a lot more whop behind it, and the trajectory was fantastic, yet it still left me wanting. I'm confident that going back to a bullet with a thicker jacket would have solved my issues, yet at 3800fps and 3 years of live testing on over 200 coyotes, my thirst for speed had not been quenched. Last fall around this time, I decided I wanted something with a bit more speed. Travis and I talked over a few different cartridges, from 22-250AI to 22-6mm. We ended up settling on 22-243 for a few reasons. 1) Relatively inexpensive winchester brass is readily available, and could be left lay in the field without crying if some were lost. 2) Making brass is as simple as running a .243Win into a 22-243 FL sizing die. No fire-forming required. 3) It should be fast enough to pick up several hundred FPS over a 22-250. First order of business was to get a reamer ordered. We looked at the dimensions offered, and decided to get a custom short-throat reamer from PTG with a 0.0" free bore which did not require neck turning, yet did not over-work the brass. We knew we wanted it to run with the lightweight bullets from 40-55gr, and virtually all of those bullets have a very short base to ogive measurement. After the reamer was ordered, I called up Chris @ Benchmark Barrels and ordered three 14-twist .22 cal blanks for a 26" finish length which were custom contoured to fit the DTA chassis and shave as much weight off as possible without sacrificing accuracy. We could afford to go down to a very small sporter contour due to the DTA barrels having about 6" of barrel supported by the chassis. That's 5" more than most rifles have. Less unsupported barrel, equals less harmonic vibration, equals a more forgiving setup. Next in line was finding some dies. There were several 22-243 sizing/seating combo die kits out there from RCBS, Redding, and a few others. Unfortunately none had a micrometer seater. I'm a huge fan of Forster Ultra Micrometer seating dies. My solution here was to buy a 22-250 seating die, and have Travis ream the sliding sleeve out to accommodate the 22-243. That will give me a perfect fit to my chamber, ensuring the brass will ride in the die straight, while having an appropriately sized seating stem. For sizing, I wanted a full length die, but the only dies which were available were RCBS, which I was not interested in. I knew that a bushing die would get me by until I could have a custom FL die made, so I purchased a Redding FL bushing sizer for .243win. I ordered a .247" bushing in hopes that would work with the winchester brass. That's about as far as we got with it for a few months. Time passed, as Travis and I both had bigger fish to fry during the summer. When it's 95 degrees and 90% humidity with mosquito's thick enough to carry off a grown man, you aren't really thinking about coyote calling much. Yet when that first crisp 40 degree morning arrives around early to mid-September, my thoughts always head toward coyote slaying. I called Travis and we kicked the 22-243 plan into high gear. There were just a few specifics I had to get out of the way while Travis was getting my barrel spun up. I use a Giraud trimmer, so I had to order a blank case holder which I will have Travis ream out just as he did for the seating die. The above represents the big pieces of the puzzle, so only a few details remained. I had a wide variety of .224 projectiles, but some were eliminated immediately for having too light of a jacket or weighing too much. I was thinking of starting with Hornady 52gr BTHP, but then Travis mentioned that he had used Sierra 52gr Match King's in the past out of a 22-250 with tremendous success. I decided to give that a go. On the way home from Miller, I stopped by Simons Outdoor Sports in St. Lawrence. Dale Simons is one hell of a good guy, and runs one of the best gun shops in the state. As luck would have it, he had two boxes of 52SMK's sitting on the shelf which I promptly snagged. Next it was time to convert my primary long range rifle, a DTA SRS-A1, into a lightweight coyote destroyer. There it is pictured above with a 26" TS Customs 6.5CM barrel, Premier 5-25x56 optic, and a DTA DTSS 338 titanium suppressor. DTA's have held a special place in my heart since I started shooting them in early 2010. In the configuration you see above, she's a little chunky with most of the weight being in the optic and in the barrel. I knew I could slim things down a bit. First was a change in optics. The Premier 5-25 Tactical is far too bulky and heavy to be walking for miles through knee-deep snow. Lucky for me Premier makes a 3-15x50 Light Tactical which is just what the doctor ordered. It's a mil/mil/ffp scope with a double-turn 12-Mil zero-stop elevation turret. There are 6 mils of left and right windage available on the side with windage-stop. I chose the GenIIXR reticle, as it provides ample hold points and nice crisp lines without cluttering things up. Consider the side focus and amazing optics, and you've got a fantastic coyote scope. To mount the scope, I wanted to use DTA's one-piece mount, since it is built like a tank and I've had outstanding success with them in the past. However, they do not make a flat no-slope mount. With only 12 mils of elevation available and the short-distance purpose (0-500yds) of the rifle, combined with the ultra-flat shooting cartridge, I wanted to get as much light transmission as possible by keeping the erector centered up good. Twelve mils would be more than enough elevation when using a flat base. We are an American Defense Manufacturing (ADM) dealer, and I've had outstanding success with their QD mounts in the past, so I decided to give them a look. The specs on their new Delta mount looked impressive, so I called to get one ordered. Unfortunately they didn't have FDE in stock at the time of my call, so I just had them send off a FDE Recon-S instead. I've used the Recon-S on DTA's in the past, so I knew it would be a perfect fit. 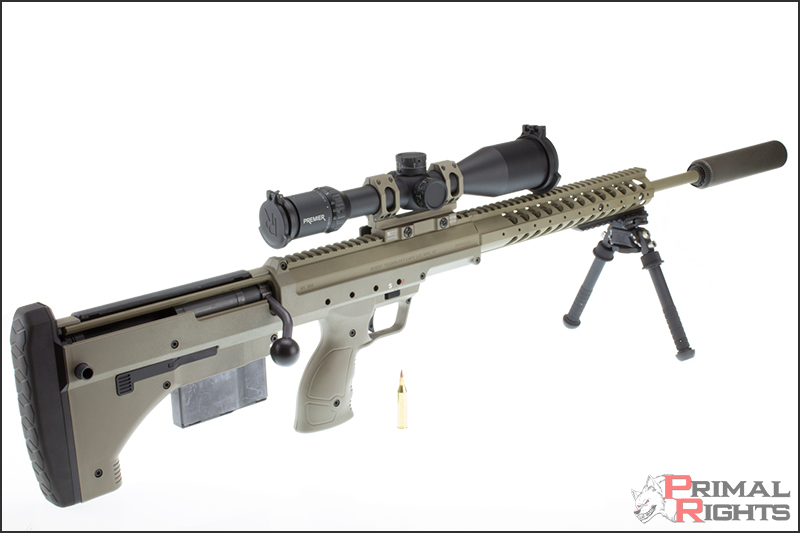 I ordered a FDE QD harris bipod swivel as well. Next was to get a lighter and less bulky suppressor. The DTSS is an amazing can, however, I certainly didn't need the 338LM rated capacity. I opted for a YHM Phantom 5.56 Titanium QD. In hindsight, I think I would have gone with direct thread mount to save another few ounces of weight on the muzzle end. Well there you have it. 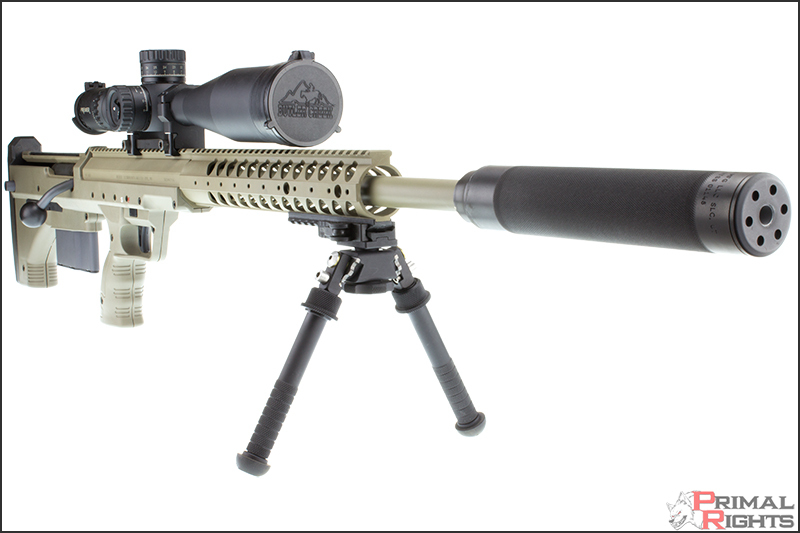 A "Predator Edition" DTA SRS-A1 wearing a sporter-weight Benchmark barrel chambered in 22-243Win by TS Customs. I had not been this excited to shoot something for a long time. It was like Christmas when I was a little boy, having unwrapped an awesome present, and getting ready to go outside and play with it. I already had a batch of winchester .243 brass necked down and primed. All that was left was to find the lands, dump some powder, and seat some bullets. I started out with my usual pressure ladder, loading in 1gr increments. I used some 22-250AI start loads to bracket my pressure ladder. I ran into some noticeable pressure at 43.5gr of Varget. I bracketed my OCW test in half-grain increments from 43gr down to 41gr. That's my index finger, and that's a standard sized staple. Roughly 1/2" group at a distance of 300yds. I didn't measure the group with a caliper, and I didn't need to. I was seeing Minute-of-Coyote's-Eyeball at 300yds. If there was an improvement to be made, I wasn't going to waste barrel life trying to find it. I had found my load. The following day I loaded up a few more rounds to verify zero on my optic. Below is a 5 shot group at 100yds. One... little... tiny... hole. I came up one click, and zeroed my turret. Good to go. Lets get to killin'! Thanks to help from TS Customs, DTA, Benchmark Barrels, ADM, and Premier Reticles, my new coyote smasher had been born. The only thing left was to find a fury pheasant snatcher and conduct field trials! After checking with some landowners, I got a plan together and set out calling. For 2 days I put in 2-3 sets a day, morning and evening, and did not see a single coyote. Dry spells are not uncommon in eastern SD. We don't have hundreds of uneducated hungry dogs like they have in certain parts of western SD, so I'm pretty used to spending my legs on lots of miles for blank sets before cashing in. I suppose I'd get spoiled if it were any other way. Then we had a monster storm hit the state. The western have was getting pounded by fierce 70mph winds and feet of snow, while the eastern half was getting soaked with rain. The storm lasted 3 days, and left western SD completely devastated. We needed the rain over here anyway, so the ground soaked it right up and gravel roads were kicking up dust again within a day. At least I got in a few stands before the storm hit. There were some beautiful mornings. The following day after the storm cleared out, I crawled out of bed at 6AM and headed out to another new spot. The wind was kicking a pretty good sustained 7-10mph when I left the house. By the time I got to my set and it become light enough to start calling, it was a gusty 10-15mph. Not exactly optimal conditions for my little barrel-burning 52gr pill, yet us South Dakotan's are no strangers to wind. I had studied my charts in Shooter pretty heavily, and while I had not yet attached some dope inside my rear scope cap, I was confident I'd be able to make contact if anything showed up. After a few minutes of calling, I noticed some movement about 300yds out. I got on it with the scope and saw it was indeed a coyote. I let him close to 190yds, held a half mil for wind, and pressed the trigger on the DTA. Zero recoil and 4100fps meant I got to watch everything transpire in the scope. The bullet found its mark just a touch farther to the right than I wanted. I should have held for about .7 mils and it would have been a perfect hit. Still, we got fur down! I called for another few minutes and finished out the set. When I walked up, my suspicions were confirmed. This dog was tiny. I'm pretty sure it's the smallest coyote I've ever shot. The shock literally burst him open on the top of his back. Nearly popped like a prairie dog. While not an adequate test of the 22-243Win's capability, it was certainly fun. I headed out again the next day, only this time I had Primal Rights employee Josh Rittel with me running a camcorder. 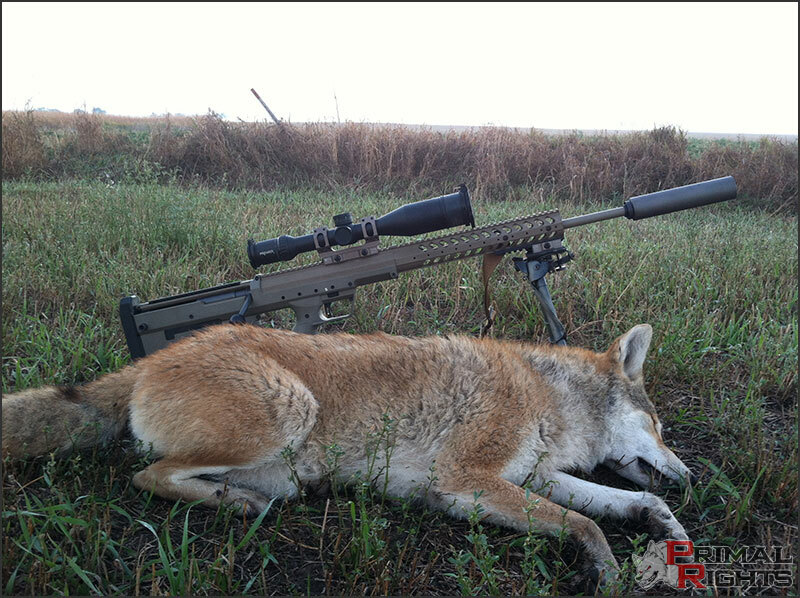 Finally we had a big burly South Dakota coyote come in that would put the cartridge to the test. That dog was all of 40lbs, 150yds out and the 22-243 flat laid him out. No twitching, no kicking, just instant hydrodynamic shock which shut him off like a light switch. Obviously it will take quite a lot more use in the field to finalize our verdict, but it is my belief that a DTA SRS-A1 is an exceptional coyote calling rifle. It can be configured to suit any role you desire, and it's extremely short overall length lets me run a long barrel with suppressor attached and still maintain excellent maneuverability. The Benchmark barrels done by TS Customs in Miller, SD are beyond accurate, and when combined with a system like the SRS and Premier optics, it makes an unstoppable combination in the field. It has been nearly a year since this project was started, so some things might not be as fresh in my mind as I would like. If you guys have any questions about the loads, dies, rifle, optics, which I haven't answered in this article, be sure to reach out. I'd be happy to help. Coyote slaying is a passion of mine, and I am always willing to help others get some fur down!